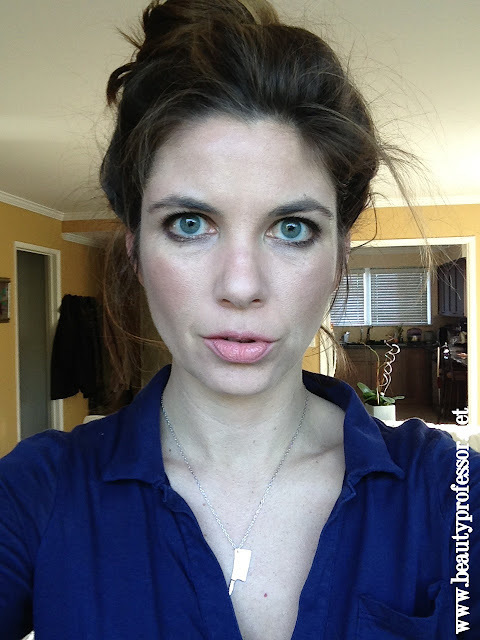 Beauty Professor: LMdB Dark Spot Corrector...My Final Review! Above: The Le Metier de Beaute Peau Vierge Dark Spot Corrector comes in an airtight pump container; it dispenses the perfect amount of product and is magnificent for travel. 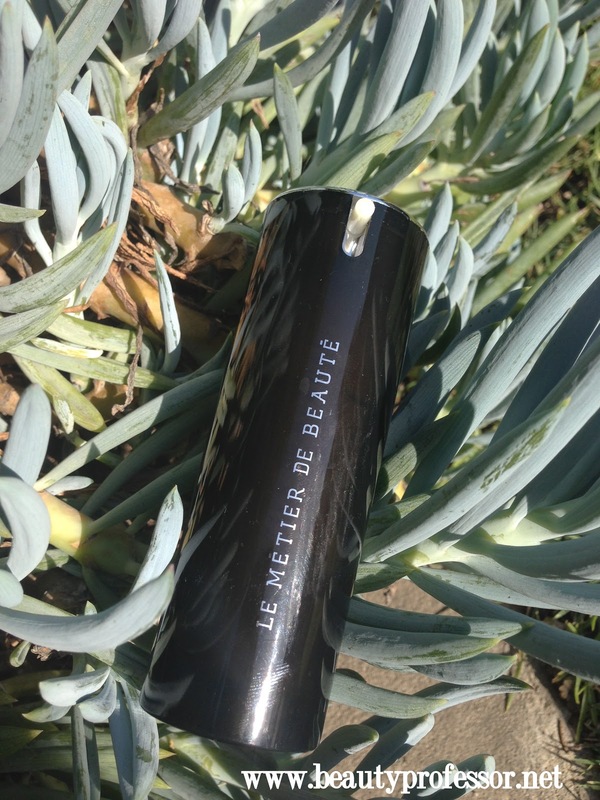 Above: Le Metier de Beaute Peau Vierge Dark Spot Corrector retails for $125 and contains .5 ounces of product. A little over a month ago, I posted a PREVIEW (which details the purpose and active ingredients etc.) 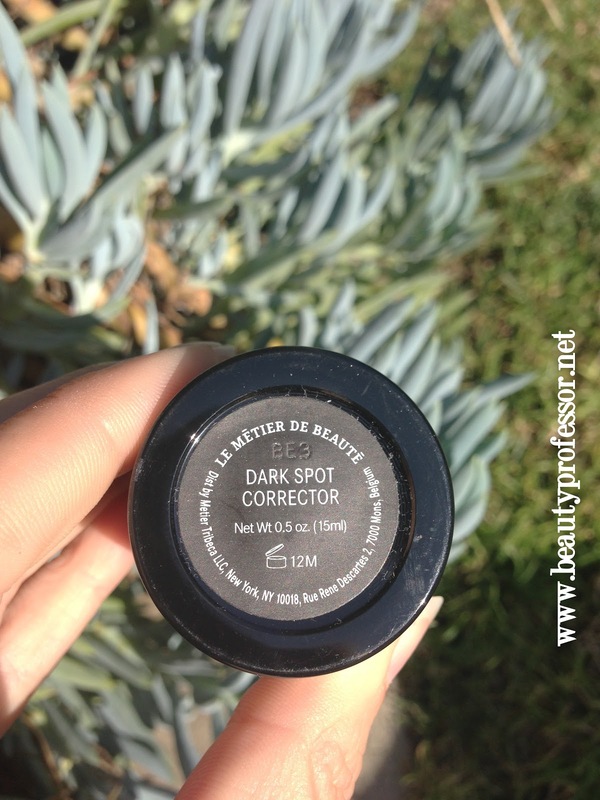 of the Le Metier de Beaute Peau Vierge Dark Spot Corrector. In light of the fact that I seem to herald the praises of LMdB Peau Vierge multiple times a month (it is indeed my singular non-negotiable skincare step), I was beyond thrilled when it was announced that LMdB was releasing a version of the formula targeted to diminish dark spots and uneven skin tone resulting from sun damage and post-acne scars. Above: A mostly makeup-free moment (aside from Peau Vierge #2 and some translucent powder)...this was taken right before starting my 28 day trial. As the image demonstrates, I deal with sun damage-induced freckling and unevenness. The source of my unevenness stems from some rather regrettable sunscreen-free summers at the beach...although I've worn a minimum of SPF 30 for years now, I am still paying for less vigilant times with freckling and dark spots, especially on my forehead, nose and upper cheeks. LMdB recommends using this product for 28 days to reach optimum results...because I tapered my application over the course of time, I gave it a nearly five week trial before deeming it time to officially weigh in on my experience. Week 1: I applied this once in the morning, followed by Peau Vierge #2 and foundation etc. and once at night; this was my sole skincare item used in the evening. During this first week, I noticed that my skin became a bit warm and tight-feeling, however, it was also quite smooth. Week 2: About halfway through this week, I reduced my application to once daily (at night) due to the reaction I was having to the retinol. My skin was becoming a bit dryer and, even though I didn't peel per se, I felt it wise to honor my sensitivity by using a bit less product. My skin was even smoother (and almost glass-like) texture-wise and my pores seemed a bit smaller. Week 3: At this point, I reduced application to three times a week (nightly) and noticed that my unevenness began to show signs of fading. Also, using it three times a week seemed to be optimum for reaping the benefits of the product's potency, while keeping my skin balanced and non-reactive. Week 4: I maintained a three times a week (nightly) application routine and was pleased to see some of my upper cheek/nose freckles lighten and fade. I also continued to note refinement in the texture of my skin. Week 5: I have integrated the LMdB Dark Spot Corrector into my regular routine, and now use it twice a week at night to maintain results. On the nights I don't use it, I apply Sunday Riley Good Genes (which uses lactic acid to refine the skin) as a night treatment. The two products seem to compliment each other; together, they work in conjunction to encourage my skin to be bright, even and smooth. Above: The culmination of nearly five weeks of Dark Spot Corrector...in this image, I am wearing Peau Vierge and a touch of the Hourglass Immaculate foundation (applied sheerly with a damp Beauty Blender). 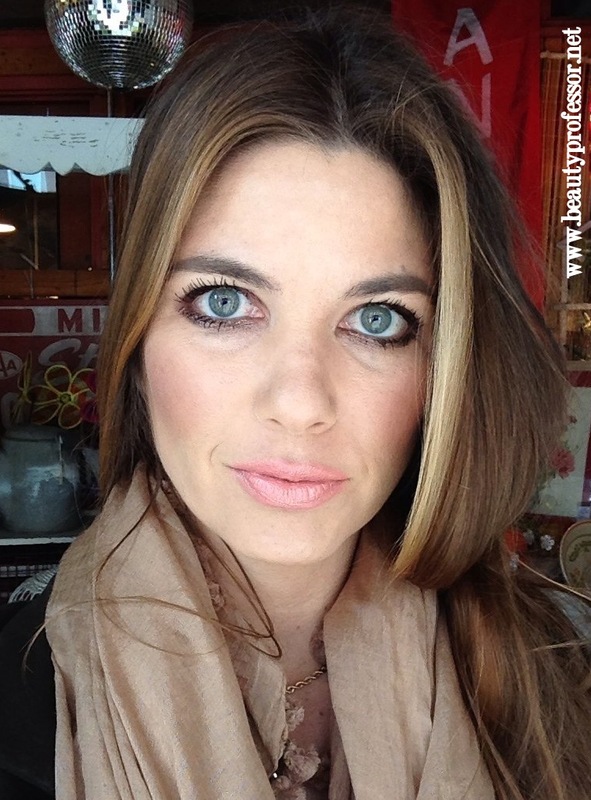 I am also wearing LMdB gloss in Two Lips...love this shade! Bottom Line: The Le Metier de Beaute Peau Vierge Dark Spot Corrector is extremely potent. The amount of cell turnover and skin refinement that I noticed, even in the first few days of use, was remarkable. As previously mentioned, by the second week of treatment I realized that my sensitive skin could benefit from this product without twice daily applications, so I reduced it to once nightly and tapered down to a few times a week by my fifth week of use. I am impressed with the power of the active ingredients (it is so refreshing to notice results with the product, almost immediately, rather than waiting months and months for a minute difference to appear) and extremely pleased with how smooth and refined my skin has become. It is important to note that those with retinol sensitivity may want to apply this less frequently (but still regularly) to avoid reaction. In closing, some of my sun damage has faded considerably; I am hopeful that with extended use, my freckles and unevenness (especially on my forehead) will continue to lighten! Overall, my skin is brighter, clearer and smoother. I recommended this to anyone hoping to smooth skin texture and catalyze the reversal of sun damage without a strong prescription (like Retin-A or Hydroquinone); for those willing to put in the effort to be consistent and diligent in their fight against dark spots, this product is a gem! My pleasure, Becky! Hope your week is going well! You're results seem fab but I just wonder why one would use such a product instead of a cream with a medical grade amount of tretinoin such as Retrieve ? Thanks and good question! As my preview post explained, this product doesn't just rely on Tretinoin/Vitamin A to accelerate cell turnover...it also contains Hexylresocinal to protect and refine skin during the process. While I am certainly not a dermatologist, I suspect that this may be one of the first products to debut this ingredient combination. Although the ingredients are potent and active, I do find it to be less intense than Tretinoin, which I tried (and stopped using) years ago. Hi BP! I wonder, I use retin-a nightly, as I have some sun damage as well. Do you think I can use this product along with it? The retin-a doesn't seem to be lightening these spots. It's so frustrating! Thanks much for the review...you are always awesome! I think that it might help, however, I would use it alone, rather than with your prescription for Retin-A. This product was quite potent for me (and my skin was used to sporadic Retin-A Micro applications) by itself, and I would hate for you to have Retin-A overload (should such a thing exist!) by combining the two products. Hope that helps and do keep me posted! Awesome! I need this product :) Thanks for reviewing! My pleasure, Julielicious!! Let me know what you think if/when you try it! Hey B.P, hope all is well with u. Once again thankyou for the informative review. I have some hyper-pigmentation due to pregnancy which gets worse in the sun! Also lots of freckles from my sunscreen-free days unfortunatly. This seems like a good investment due to the ingredients. Do u know if there are any parabens?? I'm trying to phase them out of my products and be more aware in buying skincare. Not so easy sometimes as they seem to be in everything. It's a little confusing on the web...it says they are linked to, but not cancer causing!! Any thoughts?? Thanks so much. Have a great restof the week. Good to hear from you! So glad you liked the review. I don't have the exact ingredient list, but have put in a request for it and will post in when I receive it! Navigating around Parabens is a challenge, indeed. I just received the ingredients from LMdB PR and revised this post to reflect their addition! Thanks so much for the review. I just got despot corrector from Bergdorf Goodman today (beauty event kicks off, so...).I intend to use it as spot treatment solely over my acne marks before my regular moisturizing serum. Do you think it'd be a good idea to stop using home based enzyme/glyco peeling during the time. My pleasure! Because this has such active ingredients, I would avoid peels etc. for awhile, especially until your skin gets used to it!